We offer a large collection of outdoor chairs from the some of the highest quality brands in the industry. Shop from stationary lounge chairs to swivel rocker lounge chairs in modern to traditional styles made from the highest performing outdoor materials. Our outdoor chairs can be explored by seating styles, including comfortable full cushioning, low-maintenance sling fabrics and classic woven looks. 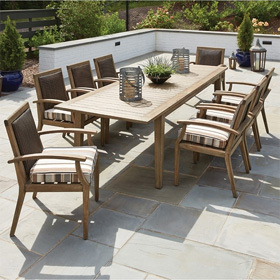 Common materials include reliable patio furniture staples such as aluminum, wrought iron, and wicker as well as cutting-edge materials like water-resistant Marine Grade Polymer.